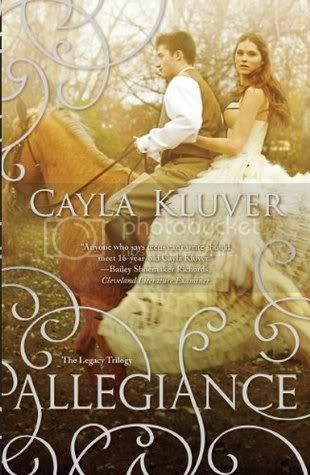 Allegiance is the long anticipated sequel to Cayla Kluvers’ novel, Legacy. I read Legacy last year, and loved the plot and wonderful writing style. I was extremely excited to get my hands on Allegiance. I have to say, Allegiance was even better than the first book! The book pretty much picks up where Legacy leaves off. Alera is now the Queen of Hytanica, being married to Steldor. Poor Alera. She was forced into a situation where she didn’t really know how to react. Being a wife, a queen; it was an experience that she was not prepared for. I love that for the most part, she was pretty strong and determined; although she did have some moments when I was yelling at her to stick up for herself! Narnia is in the hands of the Cokyrians, and is being forced to do their bidding. We don’t really get to see a whole lot of Narnian this time around, and his absence was definitely noticeable. The parts that he is in the book are enjoyable, for the most part. You definitely have to feel bad for him, as he’s being forced to do things he really doesn’t want to do. I love that no matter what; he is always true to Alera. The one character that really great on me in the book was Steldor. I didn’t really care for him in Legacy, but in Allegiance, we get to see a completely different side of him. I will always be Team Narnian, but I also now definitely have a soft spot for Steldor. My favorite character in both books would definitely have to be London. I just love that fierce protector. He definitely made the book even more awesome for me. The writing in this book was just as wonderful as it was in Legacy. Kluver definitely has a wonderful way of describing situations and settings. I was hooked on this book, it grabbed my attention and didn’t let go up until the end. There was no cliffhanger ending in this book, and I really liked that. I am also looking forward to the next book. I’m curious to see where Kluver will take us next! Overall, if you enjoyed Legacy, you will definitely enjoy Allegiance. Kluver will take you for a ride you won’t soon forget with this novel. I'm really hoping to get to this one soon as I really enjoyed the first book and can't wait to find out what will happen now. I love that you seem to get to see a different side of Steldor - definitely looking forward to that! Oh, am I ever relieved. I really enjoyed Legacy, but its such a long book. I listened to it on audio so it did go much faster then reading it myself. Allegiance, however, I can't seem to find on audio. So I will be reading it. I was worried I wouldn't like it as much as Legacy. Your review has reassured me, thank you. PS: I'm Team Narian, too. Unbelievable that big-headed, full of himself, Steldor changes to a likable character in this one. I can't wait to see how that's accomplished. I always appreciate when the second book is even better than the first. I can only imagine how difficult that is to do, too, especially with the level of writing that was in Legacy. Nice review! I had so many mixed feelings for this book, but the emotion was huge in this one. I did tear up a couple of times. It's nice like that I can't wait to learn more about Steldor, I'm now very curious about him. thanks for the review I'm glad you enjoyed it. Oh I love when a character I didn't really care for in a previous book shows a new side to themselves and makes me change my mind:) This happened to me with Cassian from Firelight/Vanish and it just made me happy:) Fantastic review Christy, glad book two was as solid as book one. And yay for no cliffhanger! I'm glad to know this one was great, Christy! I'm definitely going to have to get around to reading it soon! I pretty much liked Legacy but I'm hoping that I'll love this one even more. Aw, I'm sad that we don't get to see much of Narian. Awesome review! Great review! Thanks for sharing! I definitely need to check this series out! This series sounds wonderful and well written. I am going to have to check it out eventually. It sounds like the characters develope and change which is always welcome.